BEAVERTON, Ore. (January 5, 2011) – It’s an obsession at Nike Golf to design footwear so comfortable that golfers forget they have shoes on their feet. 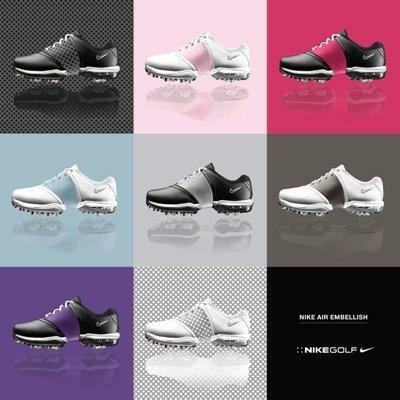 To accomplish the ultimate in comfort, fashion and performance for women, Nike Golf is introducing the Nike Air Embellish. The Nike Air Embellish features 360 degrees of midfoot support, as well as the option to color coordinate with interchangeable saddle pieces, resulting in a 4-in-1 shoe. All of these features combine for an unparalleled combination of technology and versatile style for today’s female golfer. Inspired by Nike Golf Athlete Michelle Wie, the Nike Air Embellish provides essential midfoot stability with the adjustable saddle pieces. Underfoot, golfers will experience more natural motion and power through impact with every swing with Nike’s Power Platform outsole. Other key performance features include visible Nike Air technology in the heel, and a full¬-length Phylon midsole for comfort round after round. The ability to customize every look with a variety of patterns and colors makes the Nike Air Embellish a versatile footwear option for every woman. Each shoe comes with two interchangeable and reversible saddle pieces that can be mixed-and-matched to coordinate with multiple Nike apparel pieces, resulting in a true head-to-toe look. In essence, purchasing one pair of the Nike Air Embellish offers a golfer four unique looks, all in one shoe. Wow, and they are interchangeable too…LOVING these!!! Wow, copy Adidas much? lol They just left off the three stripes. 😉 Nice looking shoes to be sure, however.